For a while now I had been wanting a work space for crafting. My apartment isn’t BIG so I knew that figuring out a space for a work space would be complicated. I reflected on how I even had to take apart my table because it couldn’t fit (while also having two functional chairs under it). In the middle of this reflection I realized that there is space for exactly one chair under the table if the table is pushed under the god awful pass through window between the tiny baby kitchen and the living room that is now my bedroom because my bedroom is too small for my bed (can’t tell I’m unhappy with my apartment, can you?). The table was the solution. I dug the table out of the closet and reassembled it. I got a few decorations from TJ Maxx to make the space look cute and then found a way to get all of my yarn under the table! All-and-all I came out of this experience only spending $20 on random decorations. Having my own workspace helps me separate crafting from school work. I craft at my work station and work at my desk. Overall, this work space has been a huge win. Recently I decided to try out making an amigurumi doll. Let me tell you that this was one of the most difficult crafts that I have tried so far. I started off using LisaAuch’s free crochet pattern for the head and torso and then improvised my way through the legs and arms. What made the amigurumi doll so hard was making it through the continuous rounds of the head/neck/torso. Once I got it down the next obstacle was the legs – I just didn’t like the idea of the continuous legs – I wanted my doll to look more cartoonish. For this, I made the legs separately and made them a bit longer. Then I put on button eyes – I was hoping for a more Coraline look but they ended up much less creepy than I intended. I think I did pretty alright for a first try. I finally decided to make an ETSY shop! I had been reluctant to make one for a while because I didn’t want to turn crafting, which I love, into a job. However – my wallet called and told me that it was time to make it happen. So yeah, a link to my ETSY shop is here. There isn’t much listed so far – but there will be more in the next few days. I’ve really been working to save space and get organized. One of the things that needed a little love was my assortment of jewelry. Because I like to be doing the absolute most at all times, I have a lot of big and/or long necklaces and a lot of dangle earrings. The necklaces kept getting tangled around each other and dangle earrings don’t even feel organized when they are free to roam. So I did what I do often – I got crafty. Issue one: What can be done with all of these necklaces? For me, the best solution to this issue was to get some small 3M Command Hooks. I just put the hooks on the wall with enough room for varying necklace lengths and hung them up (I’m not concerned with them being symmetrical, but if you are take that ruler out and make it do what it do). I doubled up some of the necklaces on the hooks to save space. Issue two: What about all of these dangle earrings? This issue posed a a bit more of a challenge for me. I’ve seen people on Pinterest use window screens to hang their dangle earrings – but I wasn’t about that finding a Home Depot or Lowes life (or about that spending any more money life – those 3M hooks are not cheap!). I decided to use something I already had on hand – a wire organizer from Target. The organizer had everything I needed, it had holes and was small enough to hang on my wall under the necklaces. So here’s what I did. Toiled for a while about how to hang the organizer from the wall. I tried the 3M hooks at first but even using 3 of them, they couldn’t hold the organizer. Eureka! I realized that I had a picture hanging kit and finally found out what those wires in it are good for! I nailed a picture hanging hook into the wall and wrapped the wire around both sides of the organizer so that the organizer hung from the wire onto the hook. I hung the earrings on the earring organizer (so exciting that it is now repurposed and renamed). I celebrated another crafting win! For me Halloween begins on the very first day of October. One of the very first things that I do is put up halloween decorations in my house. Since I’ve moved to Minneapolis I’ve been experiencing small apartment probs, but I’ve tried to make the most of it by getting crafty. To the right is the top of a bookshelf. Michaels had a lot of Halloween decor on sale in September so I procured some faux books that also are containers (probably best used for hiding your favorite candies from yourself). I also a gourd assortment thing that just looks like fall. It literally has everything that makes up fall and it was also on sale for like $7 so I got it. It will stay on the bookshelf for Thanksgiving – just like the rest of the Halloween decor. Lastly, I for a pinecone owl. It was too cute to pass up. The skull was already mine. It is a part of a skeleton set that I’ve had for years. The books under the owl are some of my favorite books. Written by John Stark Bellamy II, the books chronicle death and disaster in Cleveland, Ohio. With titles like The Maniac in the Bushes, They Died Crawling, and Cleveland’s Greatest Disasters! These books can really give you goosebumps. I also decorated my apartment door. Once I saw that people were putting up fall themed wreathes, I decided to go for it with my zombie sign. What would Halloween be like without a zombie sign? Better yet, what would Halloween be like if I didn’t let my neighbors know how much I enjoy celebrating it? After the decorating the waiting begins. There are so many days between October 1 and October 31, that the only thing one can do to fill the time and quell the suspense is watch Halloween movies over and over and over and over. Some of my favorites include Hocus Pocus, The Nightmare Before Christmas, Frankenweenie, The Corpse Bride, Halloween Town, and every Halloween special of all of my shows on TV. I also watch horror movies. This year I watched Children of the Corn for the first time in almost 20 years. It wasn’t scary at all – so that made me feel amazing. Now, on to the best part of Halloween: The clothes and the costumes! There is one halloween accessory that is only acceptable at either a party or on the actual day of Halloween. What is that item? The coveted Halloween vest! I’ve been lucky enough to come up on two of them in my lifetime at the Goodwill. The vest is to the left. I’ll be honest, I spend 364 days of the year plotting on my next Halloween costume. This year I really wanted to be Garnet from Steven Universe, but the way that grad school has been set up since I got here I didn’t have the time or the funds to invest in making the costume. So I had to get crafty (no surprise, I know). After using the internet where anything is possible, I decided to be a cat lady. I didn’t want to go with the stay at home in a robe, rollers in hair cat lady, though. I wanted to be a fashionable cat lady. So here is how that happened. I already had the cat sweater in my closet. I have a penchant for clothing items that look like they were made by a grandma. By grandma does not have to mean for grandma. Confidence makes the outfit. I got a few other clothing items from my closet: a pencil skirt, a camisole, some Betsey Johnson leopard pantyhose, and shoes. I got some stuffed cats from the dollar store. Getting stuffed cats for a dollar each makes this costume so clutch when your funds are low. I went to target and copped a few cans of Fancy Feast, some catnip mice, a dangly cat toy, a cat collar, and a plastic file folder. I took apart a pair of dangly earrings that I don’t wear and used the hook part to make catnip mice earrings. I attached the stuffed cats onto my sweater using safety pins. I decided to make the plastic folder into a cat lady clutch – I put the random cat accessories into the clutch. Because cat collars are too small for human wear, I finagled off the bell and attached it to a stretchy headband. And that is how I became a cat lady. I went to a Halloween party and won the extremely low-stakes costume contest. Pictures of the costume are below. Cut off the top of the pumpkin (around the stem part) – do it at kind of an angle so the top doesn’t just fall in. DO NOT EVER EAT THE INSIDE OF THE PUMPKIN. A carving pumpkin does not a pie pumpkin make. If you eat it or try to make a pie out of it you will be very sad. You can, however, roast the seeds in the oven if you’re about that life. The second part of this step is the most important. Do your best to scoop out all of the guts. Get that spoon up in there and take out as much of the stringy parts as possible. Failure to do so could result in a fire once you put the candle in. Unless you want to see the burning flames of [insert scary place], dig out the goop. Only you can help prevent pumpkin related house fires! Get out your little knife and let your creativity take hold. There is literally no way to mess this up. Make a face, make an animal, make shapes. If you’re terrified of this step or suffer from perfectionism, there are stencils sold at most drugstores and craft stores that can soothe your nerves. Once you’re done with your ghoulish gourd, throw a tea-light candle in there and show the neighborhood what you’re working with! Check out This (was) Halloween Part 2 for more Halloween fun! This is a backdated post. I just realized that I never made a post for this project, so I’m going to do it right here. There isn’t a lot to say about it aside from the fact that it is AWESOME. Get your crochet hook. Any size. I usually use an H when I’m doing random things. I’m just a big fan of the H.
I used two different colors of worsted weight yarn that I found at the thrift store, but you can also use a heavier weight yarn and not double it up. You just want it to be thick. Chain the amount of stitches you need to make the width of your laptop. I didn’t count how many to chain on for my 11 inch MacBook. I just chained until it was about 11.5 inches. I did a basic double crochet. You can do single. It’s your world, pearl. I just crocheted until it was long enough to hold my MacBook and whipstitched together the sides. I made a cute dinosaur appliqué to jazz it up. It will be pretty snug when you first use it. It should be. I had a few listed in my Etsy shop for a little while, and I’ve made more than a few for family/friends. I think I’m going to go back to listing them on Etsy. 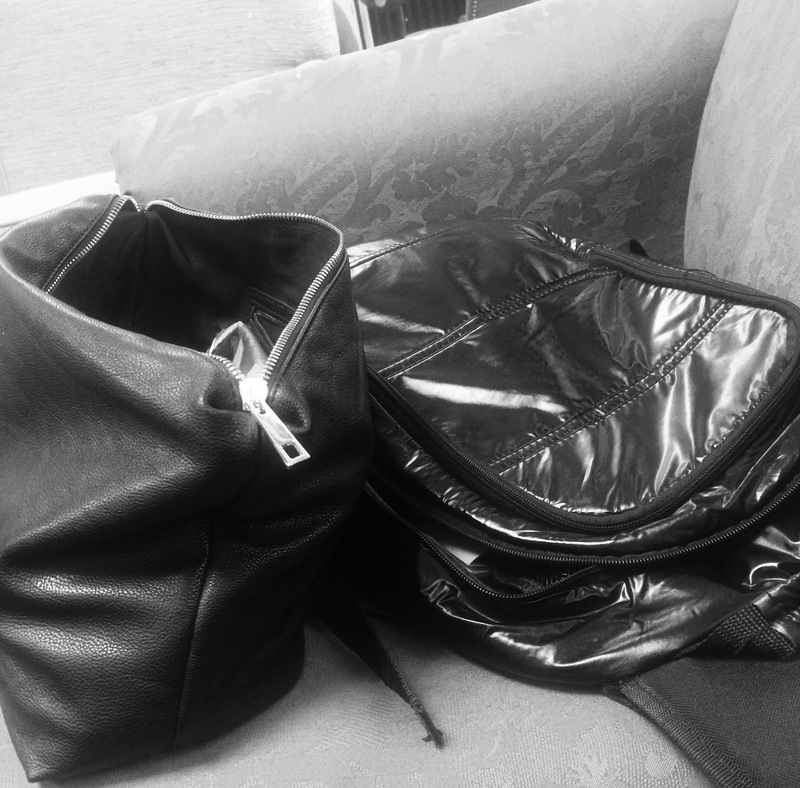 One of the things I’ve discovered is that it is very hard to make things on the road. Whether is it crocheting a scarf, starting a new craft project, or baking cookies – it can be difficult to find time and/or space away from home to make crafting magic happen. Since I’ve been in grad school I’ve learned to only take on one craft at a time while I’m on the road. Sometimes I bring a ball of yarn and my knitting needles and sometimes I ask my friends if we can bake something together. The moral of this post is that crafting is possible on the road and a best practice for me has been to pick one thing and stick to it. Gee Willikers Batgirl, it’s Crayon Lipstick! 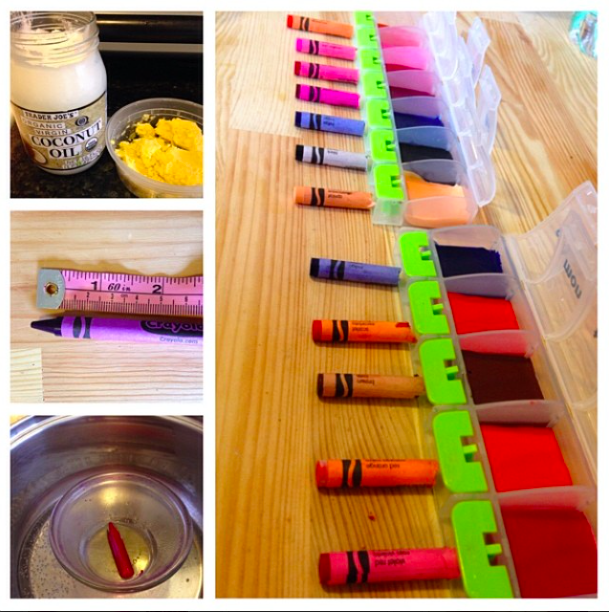 I first heard about making lipstick out of crayons from my friend Amber. I was awfully skeptical about it when she first told me it was a thing – so I went home and watched YouTube videos on the subject (like all good crafters of the 21st century do). After watching about 10 videos I become obsessed with the idea of trying it out. I decided that the weekend Curl Code came to visit would be the perfect time to make Crayola magic (or to epically and colorfully fail). Toothpicks, skewers, or a stirring device of our choice. Cut the crayons: for this project we cut about 2 inches of the crayon off. 2 inches is roughly from the tip of the crayon to right about after the “r” in Crayola. Cut it, unwrap the piece you’ve cut off and set it to the side for now. In the pot, pour about an inch of water and set the heat to medium low. Put the custard dish into the pot. Add the oil(s) to the dish. The amount of oil you use determines the opacity of the lipstick. If you want it more sheer I would suggest using 1/2 tsp of oil, and a bit less for a more opaque look*. Once the oils melt down, add the piece of crayon. We used skewers to stir the crayon and the oil until the crayon melted down. Quickly take the custard dish out of the water and pour the lipstick into your container (literally summon your inner swiftness to do this as quickly as possible because the crayon will harden). Repeat steps 2-6 for as many crayons as you want. *After our initial crayon lipstick endeavor, the colors I came out with were awesome – but most of them were pretty sheer. What I decided to do when I made a set of lipsticks for my sister was to decrease the amount of oil. For a more opaque lipstick I used 1/4tsp of coconut oil and then a tiny piece of shae butter. I’m starting this as a distraction. A distraction from academic writing, from reading, and from life in general. 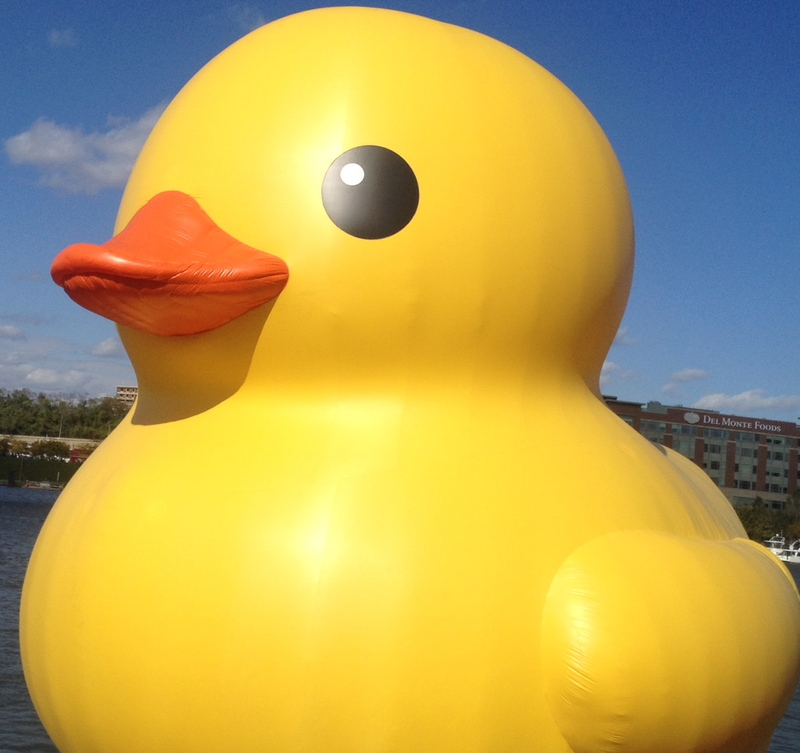 I went to see the infamous big duck in Pittsburgh (a 40 ft. replica of a rubber duck that was docked in the city for a few weeks) today – and one lesson I took away from the gigantic bathtub fowl is that people love to be distracted. As I stood in a crowd of people waiting to have my picture taken with the behemoth ducky, I really began to contemplate the important role of distraction in my own life. Not only was I concerned about how this duck acted as an “opium of the people,” but I, myself, was enamored enough with the idea of seeing this duck that I ventured out into the city with my cohort members to see it in person. I felt the pressure to have this gigantic symbol of distraction be a part of my life. Seeing it made me feel great but that sense of greatness was fleeting. I say all of this to say that I am starting this blog as a distraction. Hopefully it will be a worthwhile distraction, unlike the duck. Hopefully I will learn more about myself as I write it. Hopefully it will be more than a fleeting distraction for anyone who reads it.